Whether your gift list is long or short... or your pockets deep or not, one of these spirits is sure to fit the bill (or stocking) of an adult on your gift list! Handcrafted in the Dominican Republic from molasses, South Bay Rum is produced according to the Solera method in small batches, using matured rum from a wide range of hand-selected barrels. Each barrel – which formerly held bourbon, sherry, port or single malt Scotch whisky – imparts its own characteristics to the finished product. Blending these rums together produces South Bay Rum’s rich flavor and remarkably smooth finish – ideal for sipping or in classic cocktails. 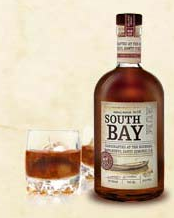 South Bay Rum (40% ABV) retails for $27.99 (750ml). Poised to take a bite out of ferocious consumer demand for flavored bourbon, William Wolf Pecan Bourbon is premium American whiskey infused with natural pecan flavors. William Wolf Whiskey is premium bourbon produced in small batches in Kentucky. They've chosen to use natural flavors from real pecans and 100% natural maple syrup. The result is an exceptionally rich, bold whiskey that is perfect served straight up or in a cocktail. Traditional whiskey lovers will appreciate William Wolf’s bold, dark taste, while fans of cocktails will be drawn to the enticingly smooth and sweet pecan flavor. William Wolf (30% ABV) retails for $25.99 (750ml). In a sign of the times, SIA Scotch was funded on Kickstarter. But don’t let that fool you! SIA (pronounced “SEE-a”) is a new, fresh and exciting Scotch Whisky created specifically to appeal to a modern palate. The striking amber color of clover honey, SIA awakens the nose with citrus and spice and opens the palate with the smoky vanilla crunch of a crème brulée. The finish is long, smooth and refreshing with hints of hazelnut and toffee. This refreshing, superior Scotch is a blend of malts from Speyside, Highlands with a slight hint of Islay, distilled in Scotland and matured, blended and bottled by Douglas Laing & Co. A delicious new scotch that is ideal for cocktails or connoisseurs!